As a critical connector in the world’s supply chains, ONE is committed to conducting its business in a responsible manner recognizing the wider economic, social and environmental impact of our activities. ONE is also committed to promote sustainable practices with its suppliers and business partners. Sustainability matters to our valued customers and our intention is to work closely with them to help reduce their risks and improve the transparency of their own supply chain, delivering greater value and a common purpose through their journeys. Placing our safety and environmental initiatives with the highest priority. We work tirelessly to improve our services in ways that are useful to society, and making every effort to meet our customers’ expectations and maintain their trust. In all of our business activities, the safety and environmental initiatives entail the highest priority. Also, we respect human rights, comply with laws and ordinances and adhere to international rules and their underlying spirit. We meet the highest ethical standards to ensure that our business activities contribute to the sustainable development of society. In our daily business including CSR related activities are followed by our basic method of thinking "ONE Business Credo" stated as followings. We encourage our business partners to act accordingly, and have established effective internal systems to accomplish this. This is integral to the way that we do business at ONE, which will remain an essential part of our company in the future. At Ocean Network Express (ONE), we recognize the importance of environmental concerns which can have long-term impact on our well-beings. We are devoted to fulfill our compliance obligations and to continually improve our environmental management system to further enhance our environmental health. This is our policy, and together we shall achieve this. From climate change to decreasing environmental quality, the shipping industry can contribute to a number of adverse environmental impacts if not properly managed. As a container shipping business, it is our responsibility to ensure our operations are handled to minimize our environmental impact. We also recognize the business value of positive environmental practices in a globally changing regulatory landscape and providing ocean transport services that have a low environmental burden for our customers. As such, we commit to using best industry practices and accelerating our environmental response with new technologies. We will focus on an effective approach to environmental management as a key aspect of our business. We establish an environmental management system which certified ISO14001 in 2018. Personnel involved in this process will receive training to understand and implement the requirements COMMITMENT TO THE ENVIRONMENT to be certified. Thereafter we will establish an environmental committee to manage our environmental impact. As part of our environmental management system we will also define our environmental goals and aspirations, developing key performance indicators (KPIs) to track and monitor our progress. The management has decided to adopt an environmental management system (EMS) back in 2017 3rd quarter. In the 1st quarter of 2018, we have established our environment management system manual, procedure and setting of our environmental objectives. The EMS will serve as the backbone of ONE’s environmental protection plan, which all employees were guided. Additionally, various trainings (internal auditor’s course, ISO14001 for management etc) were conducted for the management team and ISO project team members. ISO 14001 is an international EMS standard set by the International Organization for Standardization (ISO). Requirements for the EMS are stipulated in ISO 14001. We have received our ISO14001:2015 certificate on 05 Nov 2018 from ClassNK. The validity of this certificate is until 17 Oct 2021 (3 years) with annual audits requirements in 2019 and 2020. Click here to download copy (PDF). 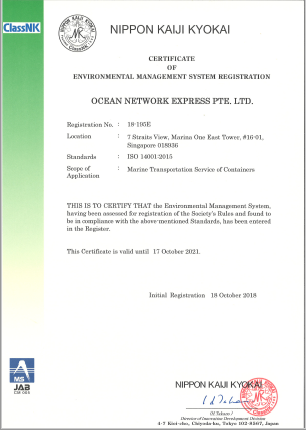 Ocean Network Express (ONE) plays an active role in educating its internal employees on issues of environmental sustainability. In so far, 15 environmental awareness workshops were conducted between April and September 2018, while ad-hoc periodic sessions are regularly scheduled for new joiners to the company. 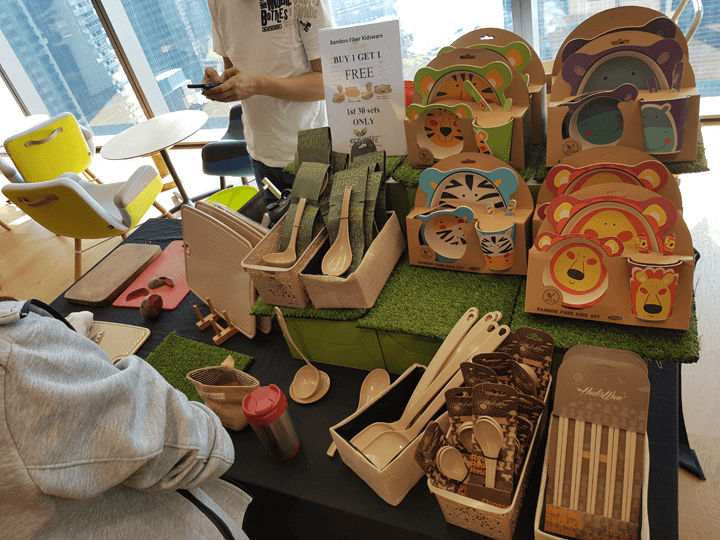 And during the recent World Environmental Day in June 2018, a mini bazaar was organised by ONE at the corporate headquarters in Singapore to help raise the awareness and importance of preserving the environment. 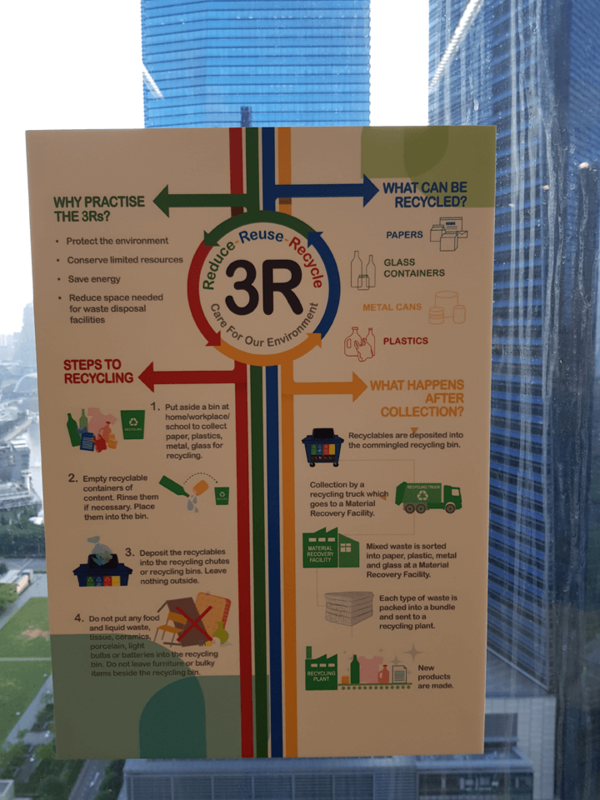 Posters and signages were put up to educate and encourage the reduce, reuse and recycling of resources. 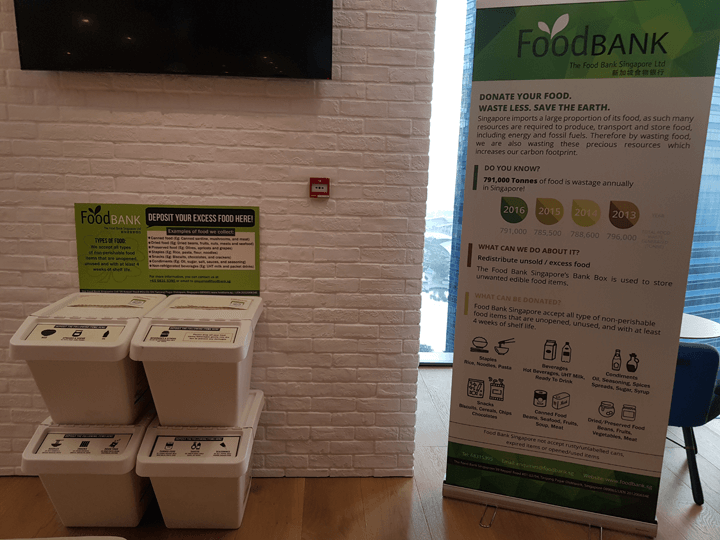 On the other hand, to minimise food wastage, “food bank” collection boxes are placed in our cafeteria to encourage employees to donate food which they did not consume to the needy. 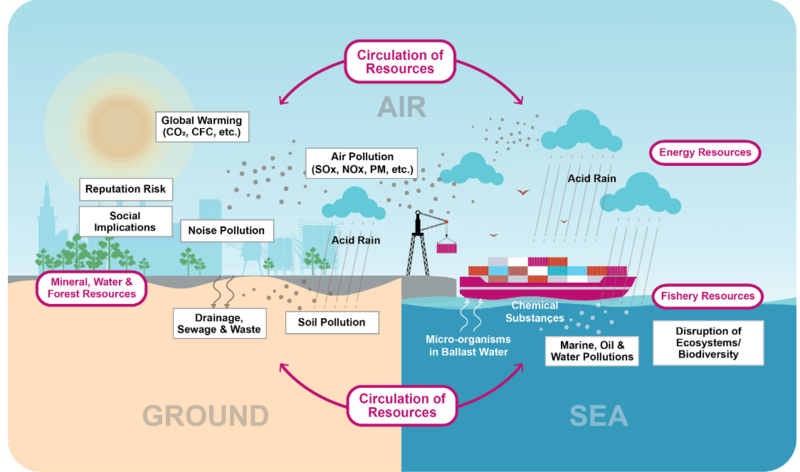 Emission of air pollutants from operating vessels, such as GHG (CO2) (global warming); SOX and NOX (acid rain); and PM (harmful to the human respiratory system). Marine contaminations from the discharge of ballast water from vessels. Various polluting effects (i.e., the toxic release of asbestos into the atmosphere, soil contaminations, etc.) that arise from the recycling process of scrapped vessels. The International Maritime Organisation (IMO) was established in 1958, as a specialised agency of the United Nations (UN). The role of the IMO is to promote international cooperation on maritime affairs (i.e., ship safety and pollution control) through the implementation of international conventions and regulations, which ONE has insofar duly conformed with. Annex 6 of the IMO’s MARPOL convention (Regulations for the Prevention of Air Pollution from Ships), regulates the need for all sulphur content in fuel oil to be gradually reduced when it was first imposed in 2005. And from 2020, the annex will regulate all ship operators to use fuel oil which contain less than 0.5% sulphur content or to remove the exhaust gas discharge of the ship with a Sulphur Oxide Exhaust Gas Cleaning System (SOX ECGS). 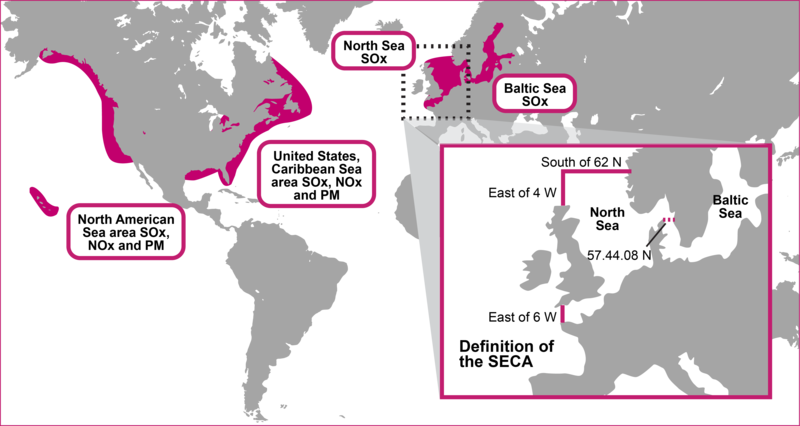 *North America, North American Caribbean Sea, North Sea and Baltic Sea are designated as Emission Control Areas (ECA). *As of today, only the regions of North America and North American Caribbean are designated as ECAs. The Baltic Sea and the North Sea will however be added from January 2021. Under the Paris Agreement on Climate Change, which went into force in 2016, 197 countries agreed to collaboratively maintain the rise in global average temperature to “well below 2oC above pre-industrial levels”, and to pursue efforts to limit it to 1.5oC. This is in addition to another initial strategy by the IMO which aims to reduce greenhouse gas (GHG) emissions from international shipping, and to possibly eradicate all emissions by this century. The strategy envisages a reduction of the total GHG emissions by at least 50% in 2050, as compared to 2008, and seeks to concurrently develop measures to entirely curb the emissions. ONE fully commits to support the Paris Agreement on Climate Change and to work alongside the IMO for this purpose. At ONE we are also prepared for the unexpected. Unplanned events and loss of containment can result in some of the most significant environmental impacts in our industry. To address this risk, our marine safety & quality team developed a Crisis Management Manual that sets out the appropriate response procedures in the event of cargo trouble or maritime accidents such as spills, ship collisions, ship damage, engine trouble, cargo damage and typhoons. In addition, the manual provides clear roles and responsibilities including CEO and reporting procedures when an accident occurs. Our regional managers went through a crisis management training to ensure the emergency preparedness of our organization. Large-scale maritime accident response training will be conducted at least once a year to ensure the effectiveness of the Crisis Management Manual and build capabilities amongst employees, ensuring our staff are equipped to respond to maritime accidents promptly and effectively. Taking on and discharging ballast water during voyage can provide a pathway for species transfer between different ecosystems. This could result in the release of harmful invasive and non-native algae, plants or animals into new environments. The IMO adopted the Ballast Water Management (BWM) Convention in 2004, with its provisions entering into force from September 2017. The Convention requires ships in international traffic to implement a Ballast Water and Sediments Management Plan, to carry a Ballast Water Record Book, and to apply ballast water management procedures to meet the standards set. 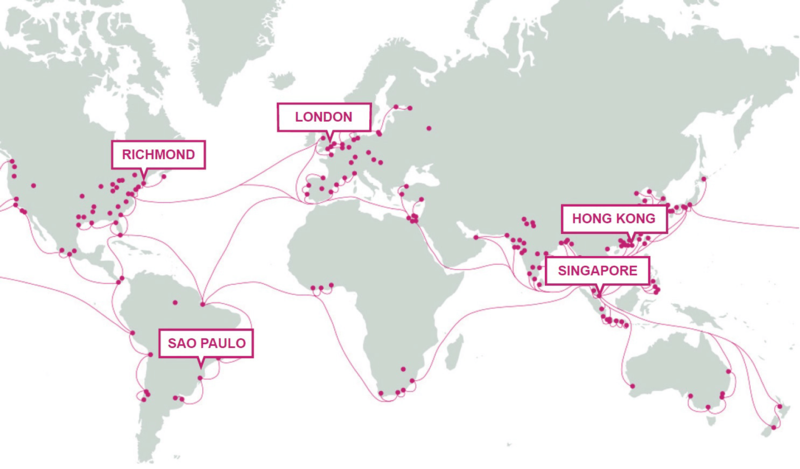 Our operating fleet at this stage comprises of more than 200 ships. These ships are chartered from our parent companies and ship owners who are compliant with environmental regulations and committed to reducing their environmental footprint. Our fleet management team will work with ship owners to select the appropriate ballast water treatment system and establish operational guidelines to protect biodiversity during transportation. Carbon dioxide (CO2) emissions from shipping currently represent around 3% of the total global greenhouse gas (GHG) emissions annually. The industry as a whole contributes to poor air quality through emissions of nitrogen oxides (NOx), sulphur oxides (SOx) and particulate matter (PM). Reducing our GHG emissions along with other air emissions is ONE’s priority and an integral part of our operations. ONE aims to join the Clean Cargo Working Group with the objective to track and benchmark our CO2 emission performance and report back to our customers and stakeholders in a standardized industry-recognized format. All three of our mother companies are already members of this business-to-business leadership initiative and ONE will pursue best practice on this front. We also plan to reduce our CO2 emissions by chartering ships from ONE’s parent companies that also apply cutting- edge technology to improve the ships’ efficiency and reducing emissions. We also plan to reduce our CO2 emissions by chartering ships from ONE’s parent companies that also apply cutting-edge technology to improve the ships’ efficiency and reducing emissions. ONE’s CEO, Jeremy Nixon, in support of the decarbonization initiative by the Global Maritime Forum, has committed to pursue emission reduction in our operations and drive changes toward decarbonization. Maximizing the energy efficiency of our fleet not only results in cost savings that can be passed on to our customers but ensures conservation of resources such as fuel and a key measure in achieving our emission reductions. ONE will develop a comprehensive data collection system to measure and monitor energy consumption from both renewable and non-renewable sources, including our bunker fuel consumption. As part of our energy efficiency measures, we will also develop and implement the international Maritime Organization’s (IMO’s) Ship Energy Efficiency Management Plan (SEEMP) and will work with ship owners to monitor and improve energy efficiency going forward. The IBIS PLUS system will facilitate the optimization and micromanagement of ship operations including fuel consumption by consolidating real time data from ships. This system will allow ONE to promptly decide on the most appropriate steps to take. We expect the use of the IBIS PLUS system to assist us in reducing our bunker fuel consumption. 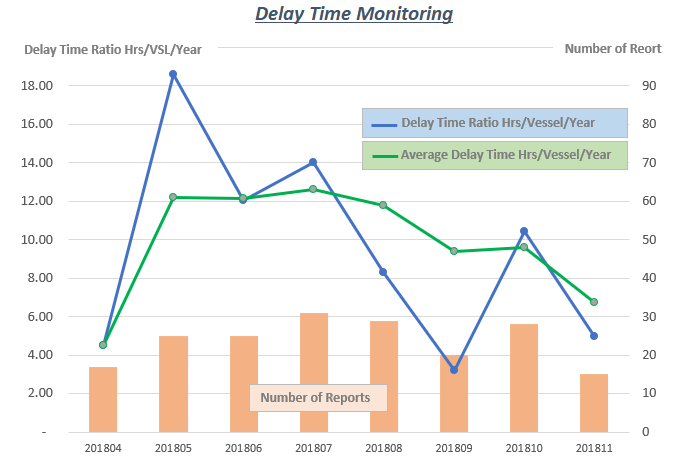 ONE launches our Marine Accident Report System (MARS), with aims of processing accident cases appropriately and swiftly, analysing accident trends, and formulating effective prevention measures. We are taking various steps aimed at eliminating accidents, by using this system to analyse accident details and trends and the deeply explore root cause of accidents. By creating a database of accident information, moreover, we are able to share information with our worldwide network in a timely manner and establish optimal safety measures. ONE has created an emergency response network based on five overseas regions, allocating Marine Super Intendent (MSI) to regional vessel operators, which aims to be ready for maritime accidents and problems around the world. Safety is and will remain our utmost priority. It is our mission to provide quality and reliable service through constant safety in the operation of our ships and the transportation of the cargo. What is the ONE-VQS system? 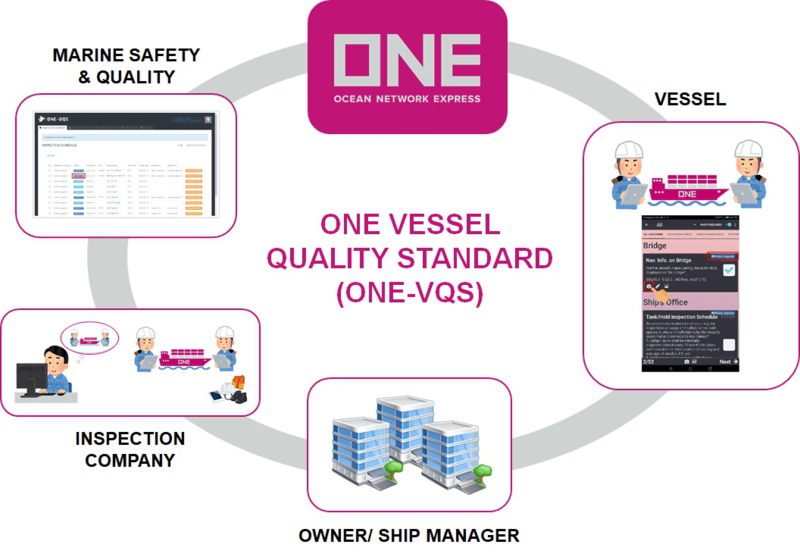 ONE installs ONE-VQS, a rigorous self-imposed safe ship management system, in order to better discharge our responsibilities to achieve safety and protect the environment. The standard covers approximately 280 items, including international treaties, international quality standards, measures to prevent accidents from recurring, and requirements from customers. The standards have been applied to all of the approximately 250 vessels in operation. We use the time that ships are stopped due to accidents or problems as a means of measuring the degree to which we have achieved safe ship operation. Our sea and land operations work together to bring us closer to the target of 'zero' downtime. Prior to embarkation, vessel operators and Marine Safety & Quality department conduct a pre-embarkation briefing for captains. This is an opportunity to explain the Company’s basic policies on safety, as well as to provide the latest specific information and instruction through safety management manuals and related written procedures adopted by each management company. In the unfortunate event of an accident, timely and accurate responses are crucial. To ensure such responses, we regularly conduct drill assuming “worst-case scenarios involving ships under our operation.” This drill involves practical training and cover everything from assembling an early emergency response team to establishing an accident response headquarters and setting up information-sharing systems within it, as well as establishing systems for communicating with overseas parties. The number of piracy incidents off the coast of Somalia and the Gulf of Aden has remained low in recent years due to countermeasures undertaken by various national troops, including Japan’s Maritime Self-Defence Force. Nevertheless, the situation could easily be reversed if the international community weakens its efforts. Moreover, piracy-related losses still occur frequently in Gulf of Guinea (West Africa) and in Southeast Asia. Accordingly, conditions for merchant ship navigation remain unpredictable. Off the coast of Somalia and in the Gulf of Aden, we endeavour as much as possible to receive protection from Japan’s Maritime Self-Defence Force and navies of various countries. For our own self-defence, we do everything possible to ensure the safety of crew as top priority. This includes avoiding problematic areas, maintaining at high speeds, using high-pressure water nozzle, installing razor wire to prevent unauthorized embarkation, and wearing bullet-proof vests and helmets. Marine Safety & Quality department publish up-to-date safety information to share accident case and good practice from our operating vessels. Lessons learned from the accidents, and environmental measures are notified to the shipowners, ship management companies, and all operational vessels through the monthly newsletter, and information is shared between onshore and offshore personnel. Global Vessel Operations conduct day-to-day operation meeting to check navigate risks timely and discuss measures against on-going issues if there is. 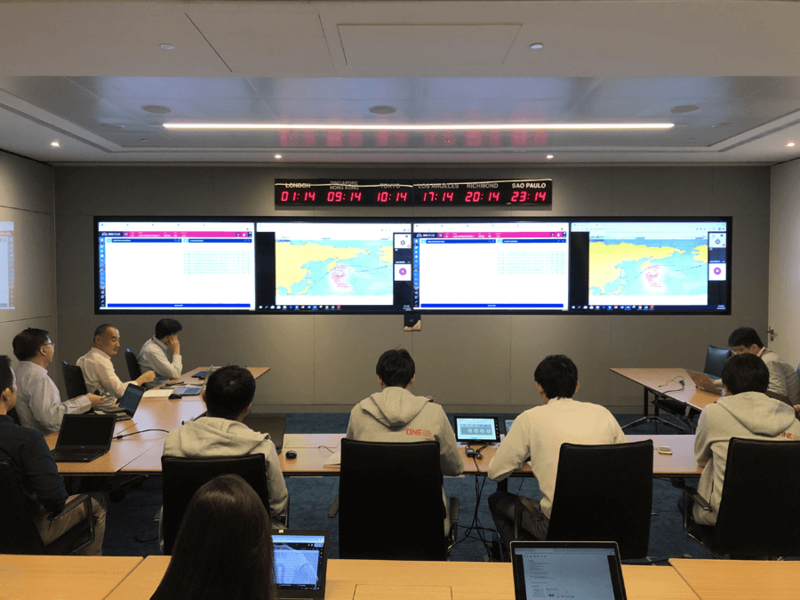 ONE global head quarter has vessel operation room which monitor operating vessels by tracking vessel’s position together with the latest weather condition. ONE periodically conducts safety enhancement campaigns to foster a corporate culture that embodies safety. Personnel engaged in onshore and offshore operations exchange opinions and deepen their mutual understanding about a main theme that is set based on current priorities. During the campaign period, Executive officers and management involving in the campaign will be conducting vessel visits to emphasize the importance of navigation safety with the captain & crews and discuss what measures can be taken on board to achieve this goal. ONE also creates opportunities for further discussion with representatives from shipowners and ship-management companies to get its safety activities to the frontline of vessel operations. As a member of Global Compact Network Singapore, we support universal principles regarding human rights and labour standards. Our commitment to human rights is expressed through our Credo and Code of Conduct. We will work to ensure that we do not contribute to human rights violations as a result of our global business activities. As a trusted employer, we will also ensure that all our employees are treated in a manner consistent with the applicable laws and labour conventions. We will work to ensure that we do not contribute to human rights violations as a result of our global business activities. A compliance committee has been established in 2018 whose responsibility is to ensure that ONE respects human rights throughout its operations and will integrate human-rights considerations into its existing management systems. ONE was born from the integration of the container shipping businesses of three companies - Kawasaki Kisen Kaisha, Ltd., Mitsui O.S.K. Lines, Ltd., and Nippon Yusen Kabushiki Kaisha. ONE Holding Company, based in Japan, oversees the governance of operational global headquarters based in Singapore (GHQ). With GHQ, ONE’s global presence through regional offices, branches, subsidiaries and joint-ventures will span across more than 120 countries and GHQ oversees the governance with delegation to regional headquarter(RHQ) based in Hong Kong, Singapore, London, U.S.A and Brazil. 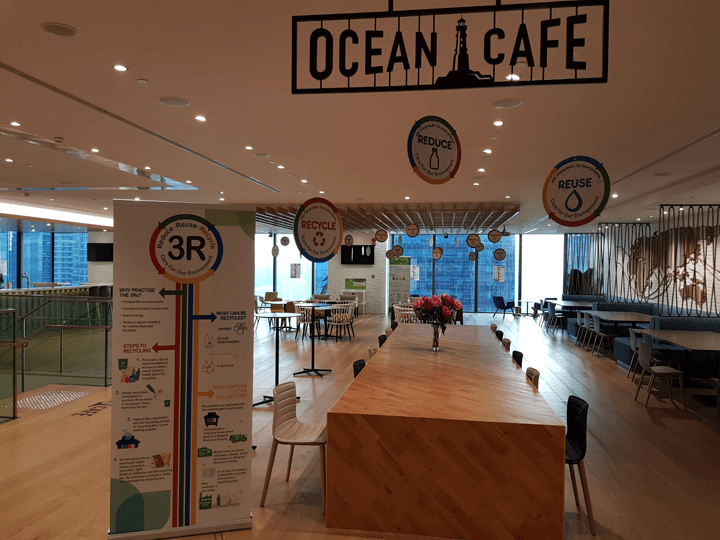 Ocean Network Express (ONE) recognizes the importance in establishing mutual trust and harmony with our business partners, who are essential to our business network. To accomplish a high service level, we aim to serve our customers with enhanced efficiency, compliance and integrity. We request the agreement and observance of "ONE’s Supply Chain Management Guideline” to support our efforts of fulfilling ONE's corporate social responsibility (CSR) project. >> For more details, please visit here. As tax laws and regulations are evolving and becoming more complex, the risk of unintentional compliance breaches is significantly increasing. ONE is committed to ensuring compliance with local requirements and working towards tax transparency and disclosure. Reliability is one of ONE’s core values and we are committed to carry out our business in a reliable manner. All directors, managers and employees adhere to ONE’s Business Credo and Code of Conduct which includes our pledge to work in accordance with the law and social ordinances as an absolute obedience. The Compliance Committee, held twice a year, establishes ONE’s compliance framework and is the driver for solidifying the culture of compliance in ONE Group chaired by Chief Compliance Officer and attended by Directors, senior management, and department heads. It determines actions required to establish, monitor and further enhance ONE’s compliance initiatives. The Committee is designed and run for each department in charge to take responsibility of its compliance including the monitoring and work as one team to tackle challenges as an organization. A global hotline system has been set up for early detection of the concurrent issues, and so to receive whistleblower reports and provide immediate consultation on various matters related to compliance. As elaborated in ONE’s Basic Anti-Bribery Policy, all directors and employees – whether directly or through third parties – are prohibited from engaging in any form of corrupt practice, including bribery and extortion.